As a kid, my favorite after-school snack was a plate of tater tots with slices of Kraft Singles melted on top. I’d stick it in the microwave to get the cheese kind of scorched. I’m not even going to pretend that my taste has evolved beyond that, but I’ll admit it was time for a renovation. Sometimes the simplest tweaks can completely reinvent something. In this case, the waffle iron came through. Smashing the tots into those crevices took them to a level of crispiness that I could never achieve in the oven, yet the insides stayed pillowy soft. I upgraded my cheese to cheddar, added bacon and jalapeños to the mix, and topped it all off with another tater tot waffle. With my first bite, I reverted back to childhood. Some of the cheese had even oozed out and gotten burnt on the waffle iron, just the way I like it. Preheat waffle iron to the highest setting. In a large microwave-safe bowl, microwave tater tots for 4 minutes. 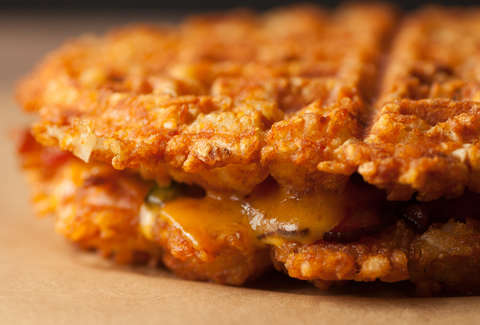 Spread half the tots in an even layer on the waffle iron, but really crowd them in there. Sprinkle with half the salt. Close the iron and cook until crisp, following the manufacturer's instructions for timing, about 8-10 minutes. Transfer waffle to a wire rack and make the other waffle with the remaining tots and salt. 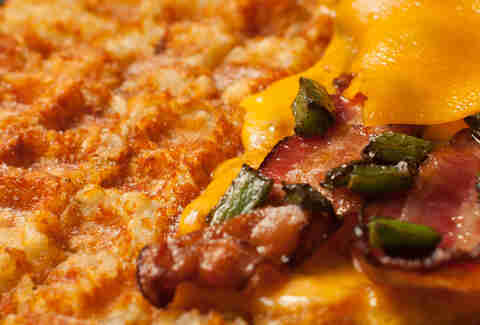 While the second waffle cooks, place bacon in a large skillet over medium-high heat until crispy. Transfer to a paper-towel-lined plate. Add jalapeño to the skillet and cook for 2 minutes in the rendered bacon fat. Transfer jalapeño to the bacon plate. Don’t remove the second waffle from the iron when it's done. 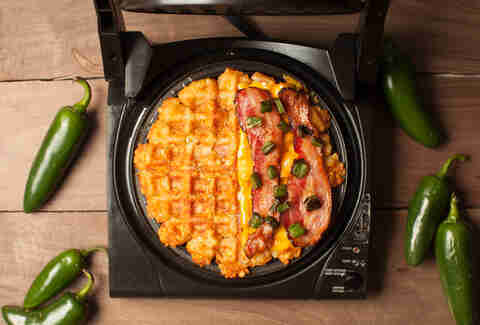 Evenly arrange half the cheese on the waffle and top with bacon and jalapeño. Layer remaining cheese over that and place the first waffle on top. Gently press the waffle iron lid down but not all the way closed. 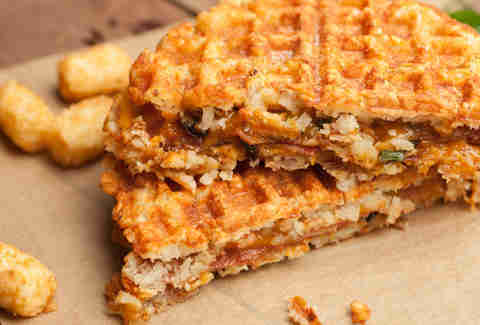 Wait until the cheese melts, about 2 minutes, then flip the whole waffle sandwich over onto a plate. Cut into four and share. Or eat the whole thing yourself.